The demise of the Partagas Factory is complete. smokeyjoe01 replied to El Presidente's topic in Cigars Discussion Forum "the water hole"
smokeyjoe01 replied to smokeyjoe01's topic in Cigars Discussion Forum "the water hole"
smokeyjoe01 posted a topic in Cigars Discussion Forum "the water hole"
Hello fellow smokers. I just read that an American citizen buying and possessing post-embargo Havana cigars in the USA is potentially at risk of a $250,000 fine and 10 years incarceration. That seems an extremely high price for a smoke, even one as fine as a Havana! Do any of our American brethren have experience of these harsh penalties? smokeyjoe01 replied to PigFish's topic in Cigars Discussion Forum "the water hole"
I want a Monte 5 now! smokeyjoe01 replied to Tollickd's topic in Cigars Discussion Forum "the water hole"
My 2 cents: bought a box in 2014, smoked half & sold the rest on because I could get 25 RASCC & change. = There’s better cigars for less money. 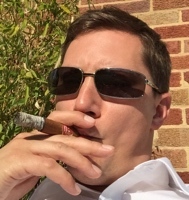 smokeyjoe01 replied to Fatshotbud's topic in Cigars Discussion Forum "the water hole"
This is my new favourite thread, after 24:24 & 24:72 naturally. smokeyjoe01 replied to cfc1016's topic in Cigars Discussion Forum "the water hole"
smokeyjoe01 replied to Ken Gargett's topic in Cigars Discussion Forum "the water hole"
I love the term ‘stogie’. Thanks for the info. I hope they get on their feet & this will help. Hope to one day visit them. Must've been fiddly getting the bands back on! Is that the one I gave you? smokeyjoe01 replied to Magpie's topic in Cigars Discussion Forum "the water hole"
smokeyjoe01 replied to Smoker's topic in Cigars Discussion Forum "the water hole"
I don't wear a watch, or any other jewellery. smokeyjoe01 replied to jwr0201's topic in Cigars Discussion Forum "the water hole"
Last one was an H.U. Mag 56 which I foolishly smoked before dinner. I didn't make dinner & had an early night! Retro-hailing, circular breathing & how long I hold the smoke depends on the strength.